Although natural diamonds have a reputation for exceptional beauty and sparkle, there are a number of reasons you might prefer to purchase a synthetic or imitation gem. From concerns over conflict diamonds and worries about the environmental impact of the diamond industry, many couples are opting for diamond alternatives. Whether you are interested in a genuine lab-created stone or one of the many faux diamond choices on the market, the key to choosing the ideal gem is understanding the advantages and disadvantages of all your options. Natural diamonds are created when carbon is subjected to incredible pressure and temperature far beneath the surface of the earth. This process can take millions of years, and natural diamonds are rare and costly. However, scientists have worked to replicate these conditions in the lab to create diamonds that are more affordable. Although this process can create very affordable fancy colored diamonds, it is still quite difficult to create white diamonds in the lab. Hansen Jewelry reports that due to the difficult process, colorless synthetic diamonds actually cost more than their natural counterparts. According to the Gemological Institute of America (GIA), manmade diamonds almost exactly mimic the optical properties, crystal structure, and chemical makeup of natural diamonds. In fact, these synthetic diamonds are so similar to their natural counterparts that it takes a trained gem grader to tell the difference between the two. Because they have the same crystal structure and chemical makeup as natural diamonds, synthetic diamonds are extremely strong and hard. This makes them ideal for jewelry that receives daily wear. If you are interested in a fancy colored diamond, Hansen Jewelry reports that the per-carat price of a manmade option is about one tenth the cost of a natural diamond. Without training and special equipment, no one will be able to tell that your diamond is not natural. In fact, the GIA is actively working to microscopically label all synthetic diamonds to make them easier to identify under magnification. Colorless lab-created diamonds are becoming increasingly more available, according to Brilliant Earth. This means that the price is likely to go down in years to come. If you are interested in a colorless diamond and are unwilling to pay more per carat than you would for a natural diamond, this may not be the best option for you. Because technology is improving, the GIA reports that lab-created diamonds are becoming more common. This could have a negative effect on the long-term value of your purchase. Unlike synthetic diamonds, imitation diamonds do not have the same chemical structure and physical properties as natural diamonds. Instead, these faux diamonds do a fantastic job of mimicking the appearance of genuine diamond. These artificial diamonds come in every shape and size you can imagine. You'll find white or colorless versions, as well as fancy colors like chocolate, yellow, pink, and blue. There are three primary types of simulated diamonds to choose from, each with its own special qualities. Various companies have created their own versions of these simulated diamonds and given them unique names. It's good to keep the options in mind as you shop for fake diamond rings. Perhaps one of the best known diamond substitutes, cubic zirconia (CZ) is a popular choice for affordable engagement jewelry. 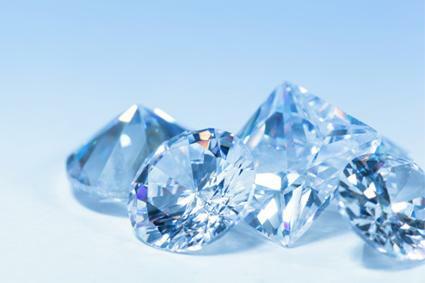 There are some important differences between diamond and cubic zirconia, namely that cubic zirconia is slightly less durable and dense than diamond. The lower density means that cubic zirconia is larger per carat than diamond. CZ is much more affordable than diamond, but this also means that the gem is of little monetary value as an investment. Diamonique is a type of cubic zirconia sold by QVC. It comes in a wide range of styles, including solitaires, rings with sidestone accents, and other designs. You'll find these rings in a variety of precious metal options, such as sterling silver, sterling plated in gold, and 14k white or yellow gold. Diamonvita Couture is a variety of CZ marketed by Helzberg Diamonds. Although the company doesn't market it as CZ, the trademark for the product makes it clear. 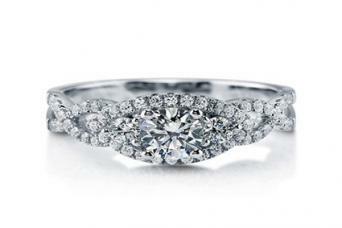 There are many lovely designs, including the highly rated Three-Stone Simulated Diamond Ring. Featuring 2.75 carats of simulated diamonds set in sterling silver, this pretty design is available in sizes five through ten and retails for about $80. Swarovski Pure Brilliance is another CZ product that is popular for jewelry. It comes in colorless options as well as every color of the rainbow. You'll see many of the same shapes that are popular in diamond jewelry. You'll find this brand of cubic zirconia in many rings, including the Berricle Sterling Silver Three Stone Ring from Amazon.com. This design features a 0.46-carat round Swarovski Pure Brilliance gem surrounded by 50 tiny accent stones. It is set in sterling and comes in sizes four through nine. This ring retails for about $55. 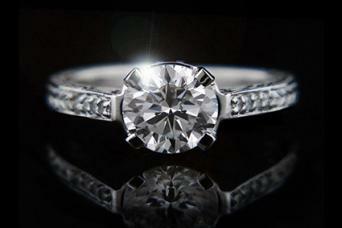 Moissanite is another diamond alternative that is popular for jewelry. There are some key differences between moissanite and cubic zirconia, namely that moissanite is more durable, sparkly, and expensive than CZ. It also has a slight gray or green tint that makes it stand out as different from either a CZ or a diamond. There are many lovely styles of moissanite engagement rings, including solitaires, three-stone designs, and vintage-style options. Glass is a very inexpensive manmade alternative to natural diamonds, and it is not a popular choice in jewelry. This is primarily because it does a poor job of replicating the qualities everyone loves in diamonds. Glass is much more fragile, only a 6.0 to 7.0 on the Mohs hardness scale, compared to diamond's 10.0. This means that it is much easier to damage when used in everyday jewelry. Glass doesn't have the sparkle of diamond. According to the University of Illinois Department of Physics, even when glass and diamond are cut the same way, the diamond will have much more sparkle. Glass jewelry is incredibly cheap. In general, glass rings are obvious because of the size of the gem. There are many affordable options on the market, including the Clear Synthetic Glass Halo Ring from Amazon.com. 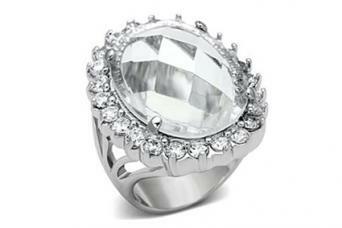 The rhodium-plated brass ring features a 17-millimeter by 23-millimeter oval faceted glass gem. It comes in a size nine only and retails for about $20. Understanding the difference between synthetic and real gems and how manmade diamonds fit in the mix is an essential first step in choosing diamonds for your jewelry. Ultimately, knowing your options can help you choose the best diamond alternative for your budget, style preference, and lifestyle.